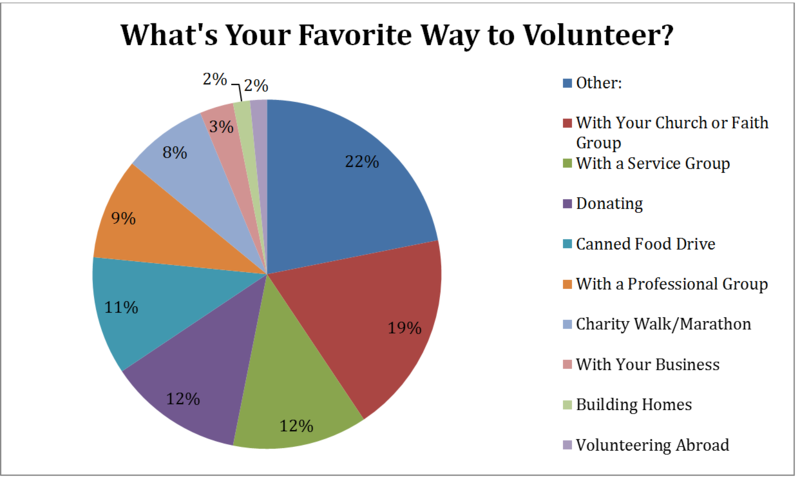 Poll Results: What’s Your Favorite Way to Volunteer? Volunteering is a great way to network. You’re helping the community and your career, all while meeting people from various walks of life. What are the best ways to volunteer? We asked our Movin’ On Up readers to share their favorite ways to volunteer last month to find out. Twenty-two percent of respondents chose “Other,” while 19% selected “With Your church or Faith Group.” “With a Service Group” and “Donating” came in at 12.5% each, with “Canned Food Drive” and “With a Professional Group” just behind them at 11% and 9%, respectively. “Charity Walk/Marathon” followed at 8%, while “With Your Business” only got 3% of the vote. “Building Homes” and “Volunteering Abroad” came in last, with just under 2% each. As you can see, our data was fairly spread out. “Other” was the top choice, and our top five answers all received over 10% of the vote. When respondents chose “Other,” their responses varied from animal shelters and knitting for charity to prison outreach and helping the homeless. There are so many volunteer paths available. Go out there and find yours! So what does it all mean? There’s no “right” way to volunteer. Some prefer to work with their church. Other’s choose to donate. It doesn’t matter how you volunteer—just go where you feel called. The type of volunteering you find interesting will vary depending on your own interests and personality. Anything else you want to tell us about how you volunteer? Let us know in the comments below! Next Post Do Millennials Spend Too Much Time on Screens?